There’s a tug-of-war behind the design of every device you own. Companies strive to find the right balance of size, weight and features based on market research and what’s worked well for them in the past. Rakuten Kobo’s done well with large-format E-Ink devices like the Kobo Aura One over the past few years. With the Forma, Kobo looks to build upon this success by giving digital book lovers more of the same, only more so. It’s larger, lighter, and comes packing more features than the Aura One. Unfortunately, when you go larger and lighter at the same time, something’s got to give. The Rakuten Kobo Forma is a wonderful device held back by a build quality issues and a number of technical missteps. Compared to Amazon’s most recent Kindles, it’s not a good look. Measuring 6.29 x 6.97 x 0.33 inches, the Rakuten Kobo Forma is currently the largest e-reader offered by a well-known brand in North America. While Onyx, Sony and Remarkable all sell larger E-Ink slabs which offer a rudimentary e-reading experience, they’re geared more toward electronic note taking than they are for maintaining a digital library. In its base configuration, the Forma is available with 8GB of non-expandable storage for $280. So long as you’re not stuffing it full of chunky Manga, comic books or PDF files, this is more than enough storage to contain thousands of books. A 32GB iteration of the device is also available for a whopping $330—the same price as a 32GB iPad. The Forma’s power and page turn buttons can all be found on the device’s bezel, similar to the design of the Amazon Oasis 2. One of the first things you may notice about the Kobo Forma is how much it resembles an Amazon All-New Kindle Oasis. Both devices boast large displays with an oblong bezel on one side, which hosts a pair of page -urn buttons. Pick up an Oasis or a Forma, however, and you’ll immediately understand that the similarities are shallow, at best. Where the Oasis sports a battery hump on one side of its chassis, the Forma is flat, both front and back. One would think this means that the Forma packs a smaller battery. 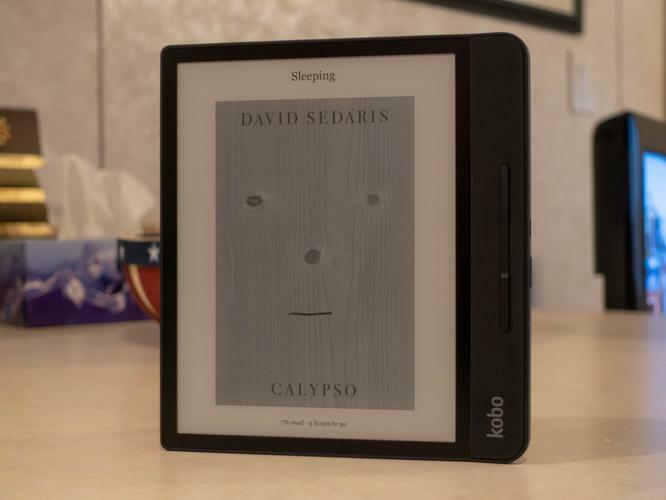 Not so: where the Oasis contains a 1,000mAh battery, the Kobo device is equipped with a 1,200mAh battery. In either case, depending on on your habits, you’ll be able to enjoy weeks of reading, on either device, with a single charge. Happily, thanks to the Forma’s IPX8 rating, you’ll be able to burn through a lot of the this time reading in a hot tub or at the beach. The Kobo Forma can be completely submerged in up to two meters of fresh water for two hours at a time and continue to work just fine. You should know, however, that unlike Amazon’s Oasis 2, it’s not possible to deactivate the Forma’s touch controls before exposing it to water. This could mean that the device will mistake the liquid on its display for input from your fingers. It makes for a frustrating reading experience. With the amount of screen real estate that the Forma offers readers, Kobo had a tough choice to make: If they’d opted to provide the device with premium feel, through the use of heavier, more resilient materials, its large size and heavier weight would have made it unwieldy and uncomfortable to use one-handed for extended periods of time. Instead, Kobo opted for lightweight materials. The result of this decision is that the Forma is comfortable to hold and is light enough that it’s easy to forget it’s there when tossed in a backpack or purse. But it feels flimsy compared to Kobo’s excellent Aura One, and positively cheap when held up against Amazon’s aluminum-bodied Oasis 2. During testing, I discovered that going light instead of resilient might not have been the best idea. Like a number of Kobo’s other devices, the Forma is waterproof. During testing, I experienced issues with the build quality of the Forma on two separate occasions. First, while testing the device’s waterproofing, I submerged the Forma provided to me by Rakuten Kobo in a few inches of water. After three minutes, I retrieved the Forma and discovered that it would not respond to any touch commands, nor did it recognize input from its page-turn or power buttons. Its screen remained locked at 100% brightness until its battery was depleted. Giving Kobo the benefit of the doubt, I went out and purchased a second Forma with my own money. It refused to charge via USB. As such, I returned it to the store and contacted Kobo’s PR team. They offered to send me a third device, which performed fine for me in every way. Via email, I asked Kobo’s PR for comment on quality control issues such as those I experienced. At the time that this review was published, no such response was given. Kobo fit an 8-inch, 1920x1440 (300ppi) E-Ink Mobius display into the Form’s ample frame. Mobius E-Ink displays tend to be lighter and a little more flexible than their E-Ink Carta counterparts, Given the large size of the Forma’s display and how thin the e-reader is, a little flexibility in the name of durability is a welcome feature. Like the Kobo Aura One before it, the Forma features ComfortLight PRO front lighting. Instead of offering a single front lighting color, like Amazon does with its line of Kindle e-readers, Kobo’s ComfortLight front lighting LEDs offer several different hues, ranging from white to a soft blue or a deep yellow-orange. If you feel that taking in too much blue-spectrum light before bed is keeping you awake at night, a ComfortLight-equipped e-reader might solve your problem. When perusing your digital library, you’ll be able to turn pages by using the Forma’s page-turn buttons or tapping at the device’s capacitative display. Thanks to a built-in accelerometer, it’s also possible to use the Forma as a right or left-handed device. 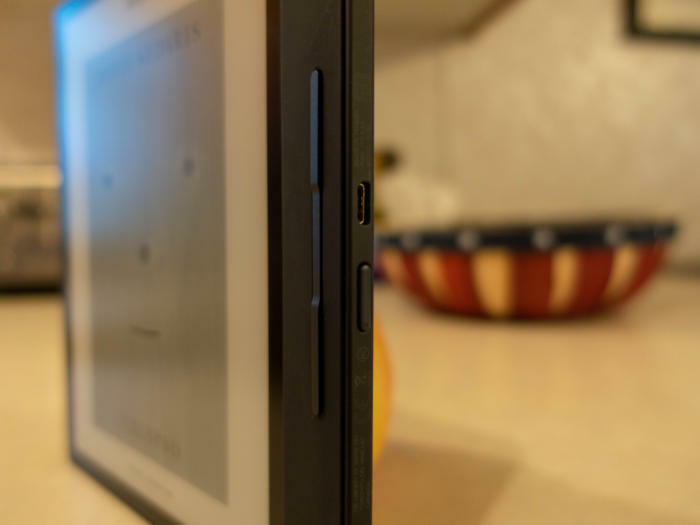 Turn over the e-reader, and the display will re-orientate to accommodate your needs. Granted, Amazon’s Kindle Store and Kindle Unlimited are still the best option for North Americans looking for one-stop eBook shopping. However, Kobo’s digital offerings have, in recent years, become a compelling alternative for those who choose to avoid Amazon or prefer to hunt down free content online to read. Excluding books that are available only through Amazon, the Kobo Store offers just as wide a variety of bestsellers and other titles as Amazon does. For those who often side-load their reading material, the Kobo Forma supports 14 different file formats, including EPUB, EPUB3, PDF, MOBI, JPEG, GIF, PNG, BMP, TIFF, TXT, HTML and RTF. As with Kobo’s other recent devices, the Forma also supports CBZ and CBR, file types often associated with comic books and manga. The device’s large, crisp display makes reading comics and other graphic content a joy. Features such as a contextual dictionary, a lack of advertising (looking at you, Amazon,) and the ability to alter font spacing, weight, line and gutter spacing on a granular level all add to the Kobo Forma’s outstanding reading experience. 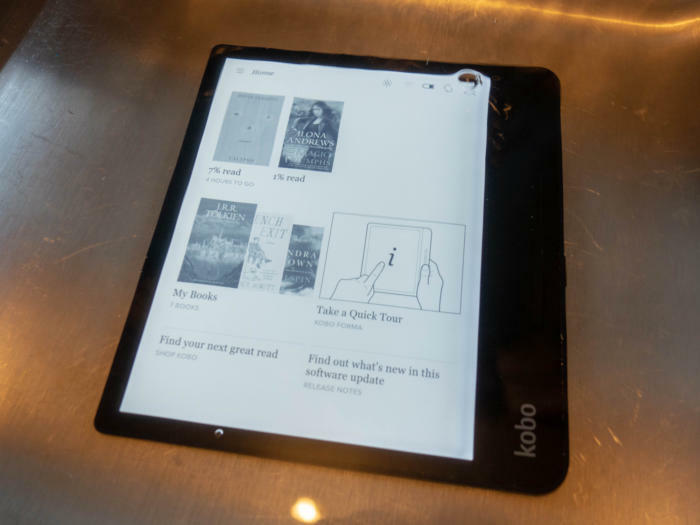 The greatest advantage that Kobo has over Amazon is the amount of free content made available through two of the services built into the Kobo operating system: OverDrive and Pocket. OverDrive makes it easy to browse, reserve, and read the digital content available via your public library. Simply enter your library card number and passcode: Boom, you’ve got free books. With the Forma, OverDrive is easy and pleasurable to use. The same goes for Pocket. For those unfamiliar with it, Pocket it an online service that allows readers to select articles found online to archive and read later when they have the opportunity. I use Pocket to save research and long-form writing that I haven’t the time to dig into while I’m working. Reading these saved stories later on a Kobo device, the Forma included, is something I look forward to all week. Unfortunately, one area where the Kobo, can’t compete with Amazon is in the area of audiobooks. None of the eBook readers in Kobo’s stable are capable of playing audio content. This includes the Forma. With the recent release of the latest iteration of Amazon’s Kindle Paperwhite, all of Amazon’s current generation e-readers can play Audible audiobooks. For some who were considering the Forma, this could be a deal-breaker. Those who consume a lot of graphic content, or whose eyesight requires them to use a larger font size while reading, will love the Kobo Forma’s crisp, expansive display. That the Forma is waterproof and insanely light, and offers multiple methods to stock it with content, could make it appealing to some readers. However, quality control issues, and a high price could make others wary.